This thrilling 2019 15 gram Chinese Gold Panda 200 Yuan Coin is the latest issue in the famous Gold Panda coin series from the world-famous Chinese Mint. Released for the first time in 1982, by the People’s Bank of China, the cherished Chinese Gold Panda series were struck from .999 fine gold. First produced in four sizes of 1/10, ¼, ½, and 1 oz., these impressive coins were later also minted in 5, 12 and 1/20 oz. weights. These remarkable bullion items are famous all over the world due to their yearly changing reverse image which depicting each year a new representation of the lovely panda bear. 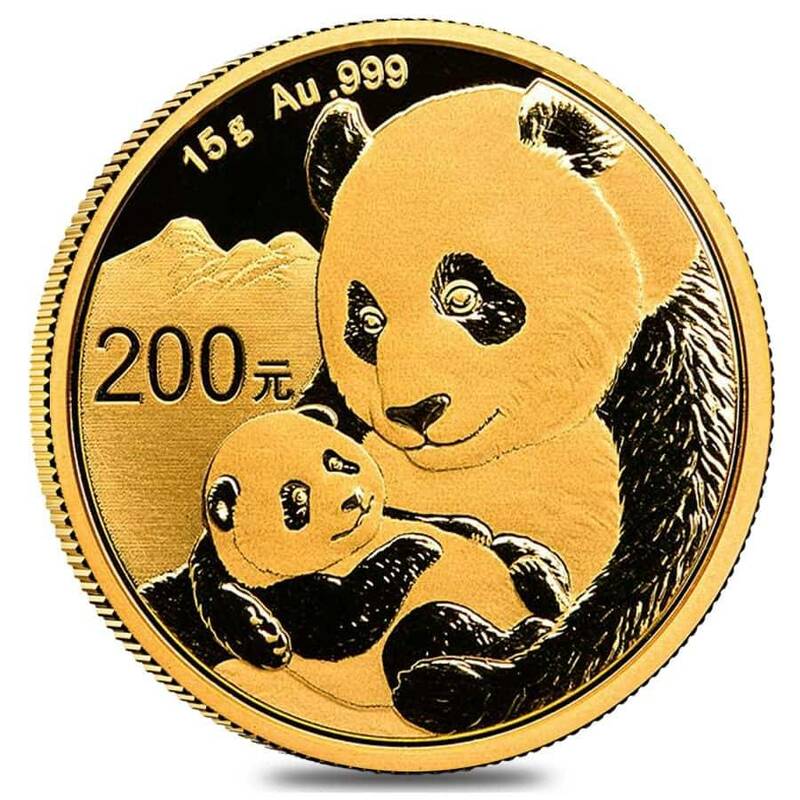 However, in 2016, the Chinese Mint changed the weight of the coins to grams, and now the Chinese Pandas are available in 1, 3, 8, 15, and 30-gram bullion options and 1 kilo, 150, 100, and 50 grams proof coins. The obverse features famous China landmark Beijing Temple of Heaven with Chinese inscription above the image reading, "People's Republic of China" and the date of mintage. Made of .999 fine gold with a weight of 15 grams. Produced by the preeminent Chinese Mint. Minted in Brilliant Uncirculated Condition. Individual coins come sealed in plastic. Lots of 10 come in a divided sheet of plastic. Carries a denomination of 200 Yuan. Approved to be included in Precious Metals IRAs. Legal tender coin in China assured by the People’s Bank of China. Obverse: Showcases the China landmark Beijing Temple of Heaven - the Temple of Heaven and its Hall of Prayer for Abundant Harvests. Inscriptions: Chinese characters for “People’s Republic of China” and “2019”. Reverse: Showcases the latest image of the adorable panda bear. Inscriptions: the purity, weight, and denomination of the coin. Bullion Exchanges offers you a stunning array of impressive gold bullion coins. 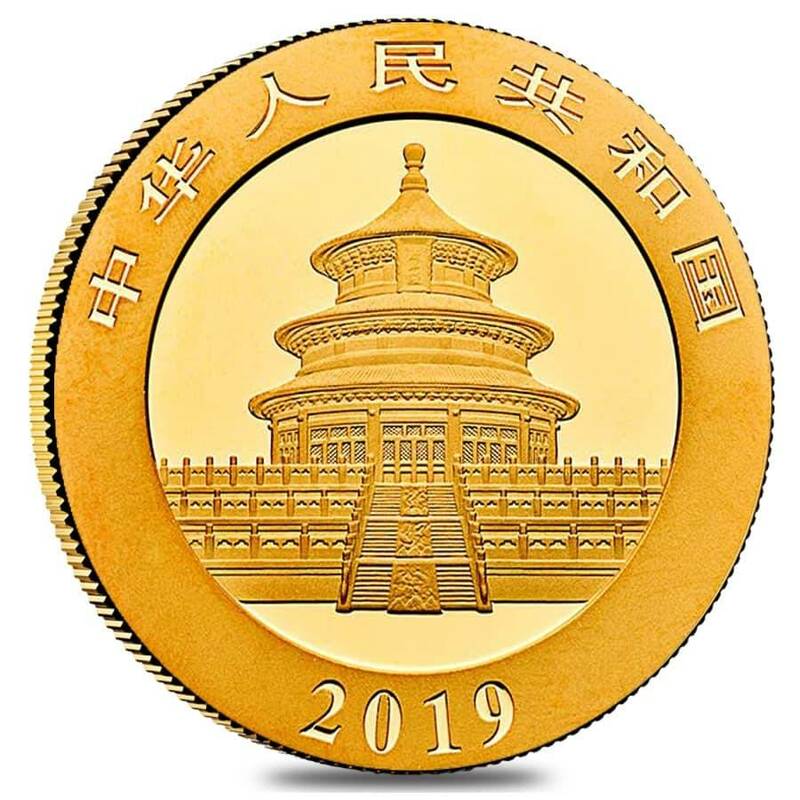 Add this beautiful 2019 15 gram Chinese Gold Panda 200 Yuan Coin to your portfolio today, and it will be thoroughly wrapped, packaged and shipped to your address in no time. For any questions, just call us at 800.852.6884 or send a message, and we’ll happily assist you. With this purchase, you earn 664 Bullionaire Bucks 664 BB = $0.66. We currently have 161 of this item in stock. For every $1 spend, you will earn 1 Bullionaire Buck which is equivalent to $0.001 off a future purchase. 664 BB = $0.66.